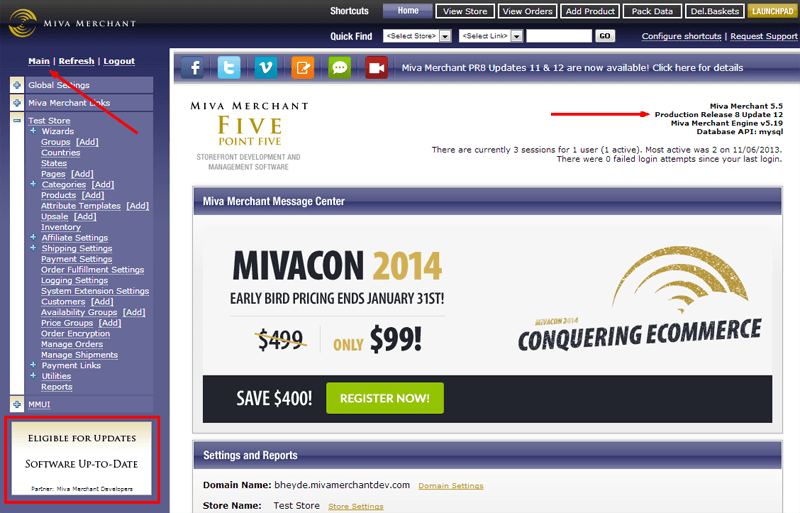 Below is a screenshot of what your Miva Merchant Admin should look like once you login. There are two areas highlighted in orange you will need to be aware of, both of which are described in detail below. The first step is to determine what version of Miva Merchant you are currently running. You can quickly see this information by looking on the right side of your admin, under Apps & Themes. 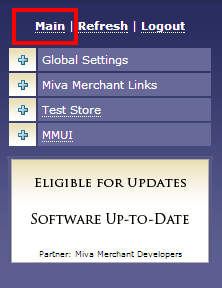 If your store currently says Miva Merchant 9.0000 or newer (9.0001, 9.0002, 9.0003, etc) then you can simply run Miva Merchant's streaming updates. This is done by clicking the Updates Available link in the admin header. This will bring up a popup window to guide you through the update process. If you have a popup blocker make sure you allow popups from your store in order to view the update window. This window will tell you the next version available to install. Leave "Automatic Installation" selected and hit continue. Miva will download the update and install it for you. The entire process only takes a few minutes. The more versions it needs to download and install the longer it can take. What do I do if I am not on the latest version? Please read below to see the answer to this question. 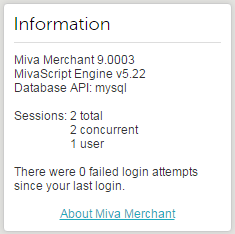 Below is a screenshot of what your Miva Merchant Admin should look like once you login. There are three areas highlighted in red you will need to be aware of, all of which are described in detail below. The first step is to determine what version of Miva Merchant you are currently running. You can quickly see this information by logging into your Miva Merchant admin and click on the Main link above the left category tree. The answer to this question depends on what version you are currently on. 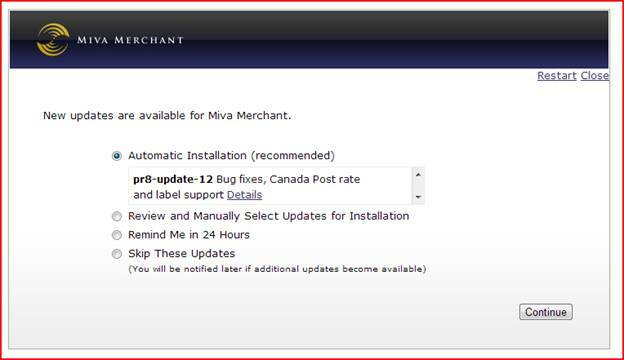 If your store currently says PR7 Update 7 newer (8, 9, 10, 10pt1 or 11) then you can simply run Miva Merchant's streaming updates. This is done by clicking the Software Update button below your left side navigation. This will bring up a popup window to guide you through the update process. If you have a popup blocker make sure you allow popups from your store in order to view the update window. This window will tell you the next version available to install. Leave "Automatic Installation" selected and hit continue. Miva will download the update and install it for you. The entire process only takes a few minutes. The more versions it needs to download and install the longer it can take. If your store says PR8 Update 1 though update 6 the process outlined above will be exactly the same. The big difference is PR8 Update 7 makes changes to how customer passwords are stored in Miva. Update 7 encrypts all customer passwords for better security. For most stores there is nothing additional you need to do. The upgrade wizard will warn you it will be encrypting customer passwords and you can continue though the upgrade process. However, if you have a module that allows customers to login with their email address currently, the upgrade wizard will force you to uninstall this module before you can continue forward. This feature is now built into Miva Merchant and the existing "Login with Email Address" modules will stop working post update 7. If you find yourself in this scenario, contact your web developer/webmaster to have them remove the module for you and setup the built in login with email functionality (this requires some template changes). Miva Merchant Professional Services can also help if needed. The other thing to be aware of regarding the new customer encrypted passwords is any external custom integration you may have that reads or writes customer data from Miva's database. If you have any sort of third party system that does this you will want to stop and determine what impact the encrypted customer passwords will have on this system before moving forward. What If I am on a version of Miva less than PR8 (PR5, PR6, PR7)? If you are on an older version of Miva outside of PR8 then there are a few more things to consider before upgrading. Modules - If you have any 3rd party modules installed in your store, most modules have an upgrade fee when going from one major version to another (PR6 to PR7 for example). In most cases the upgrade wizard will warn you which modules will need to be updated before you can continue. You will need to contact the module developer to purchase the latest version of the module before continuing forward. Template Changes - Some updates to Miva Merchant have template changes which need to be made manually to be able to take advantage of the new functionality contained in the update. You'll want to pay attention to these template changes and make them where necessary. 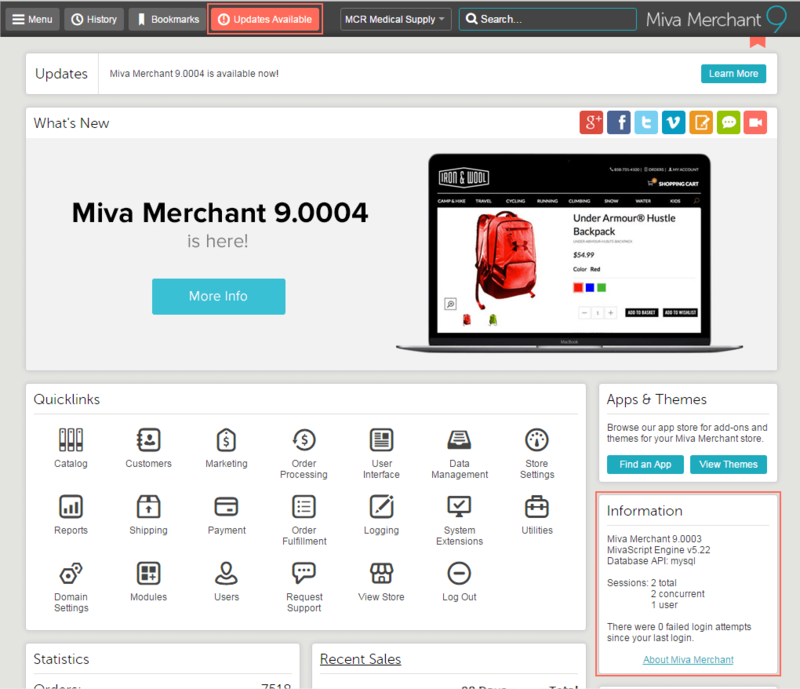 All the template changes can be found at the end of the Miva Merchant Reference Guide. What If I am on Miva Merchant 4.x? Miva Merchant 4 is over 10 years old and is no longer supported. If you are still running a Miva store on version 4.x then you will need to upgrade to Miva Merchant 5.5 as soon as possible. This requires your store to be re-built in the Miva Merchant 5.5 platform. Please contact our Professional Services Team if you need any help with this migration. 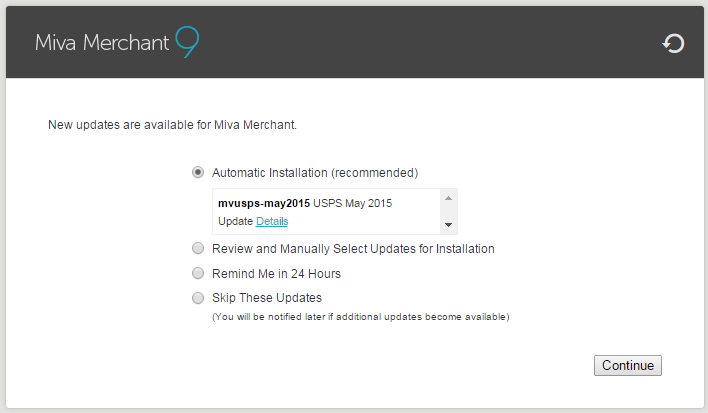 Please note: Miva Merchant 5.5 is now outdated and will need to be further upgraded to Miva Merchant 9.